Outsider art has always been tricky to define. Simply put, an outsider artist is one who is self-taught and thus removed from art world conversations past and present. Their work is often defined by a refreshing lack of self-awareness and a visceral closeness between artist and work that is sometimes hard to find in art school grads. But whether or not a rigid distinction between the art world's insiders and outsiders truly exists remains a contested issue, one that grows only harder to decipher as more and more outsider artists are welcomed into the galleries and museums once reserved for the insular elite. Enter the Outsider Art Fair, which, since its inception in 1993, has expanded to feature 47 art galleries from around the world. With write-ups in The New York Times and contributing Manhattan galleries like Marlborough Chelsea and ZieherSmith, the artistic gap between inside and outside is narrower than ever. Not to mention, this year the fair switched dates to coincide with New York's epic Frieze Fair. What does Andrew Edlin, who acquired the Outsider Art Fair in 2013, have to say about all this? We reached out to the gallerist and collector to talk about what to expect from this year's spectacle, the difference between insider and outsider art, and whether we should even care about this distinction at all. Why did you decide to switch the fair's date this year to coincide with Frieze ? Well, I think it was sort of a logical progression. When Sandy Smith originally founded the fair in 1993, he was contextualizing the fair with folk art. He did it in January because that's when the winter antique show was. Then last year, when I bought the fair, it was already scheduled and we weren't going to change the date the first year in. It was such a tremendous success, the press couldn't stop talking about how the work was so great, and it deserved to be viewed in the context of mainstream contemporary art. Besides that fact, from a practical standpoint, that it's always been zero to 10 degrees in January, it seemed like a great opportunity to move the fair to May during the big art fair weekend in New York and have the work shine in the context of the contemporary art world. How much of the outsider art on view is contemporary, would you say? I don't know the answer to that off the top of my head but I would think it's 50/50. And I don't think for the work to be contemporary the artist necessarily has to be alive. Are there still outsider artists emerging today? Definitely. We're still discovering them and they're still discovering us. What is the significance of blue chip galleries like Marlborough Chelsea taking part in the fair? It seems to me that, whether it's institutions like the Venice Biennale or galleries like Marlborough Chelsea or even Michele Maccarone, who is doing an exhibition of Eugene Von Bruenchenhein, people are just recognizing great art as great art and the labels attached to it become less important. Do you think the goal of outsider art is to raise it to blue chip status, because that is what is desirable in the marketplace, or is there a different goal there? I think we're certainly always looking to enhance the stature of outsider artists. To a large degree, our first job is to raise the awareness level. That's what we're doing by moving the fair to Frieze weekend. In the last year the art world at large has done a great job of that. Carnegie International was really groundbreaking this year and other important museum shows, like the Philadelphia Museum and the Hayward [Gallery] in London. I think more and more there seems to be a proliferation of outsider art shows at venues that are not viewed as traditional outsider art venues. And that is introducing contemporary collectors to the work. If someone is attending the fair with little knowledge of outsider art, what are some questions they should ask when looking at an artwork? I think they're really the same as with any artwork. I would say that brings an interesting subject up about what separates outsider art from insider art, for lack of a better term. Most of the art made by trained artists is informed by art historical references and outsider art is not. I think outsider art tends to be more autobiographical; there tends to be less distance between the artist and the art. There may be less inquiry as to what the image is trying to communicate or represent. But otherwise, a lot of the questions would be the same -- questions about the artist, his or her body of work, where the piece fits into his or her body of work, those sort of things. Is there any particular artist we should look out for? There are a lot of interesting galleries that are joining the fair for the first time; the ones not from North America are particularly interesting. We have galleries from Sao Paulo, India, Japan -- there's a lot of new blood coming to the fair. Marlborough is showing the work of Tony Cox, a self-trained artist, very known in skateboarding circles, so I'm told. We're going to have two panel discussions. 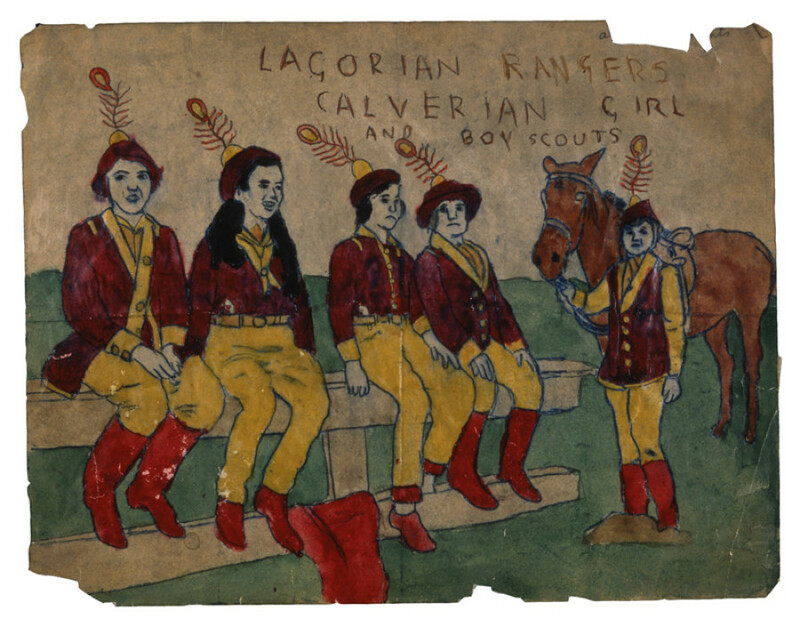 One on Henry Darger, discussing all the recent research that's been going on, and one on Jean-Michel Basquiat, addressing what happens when the art world embraces a self-taught artist. 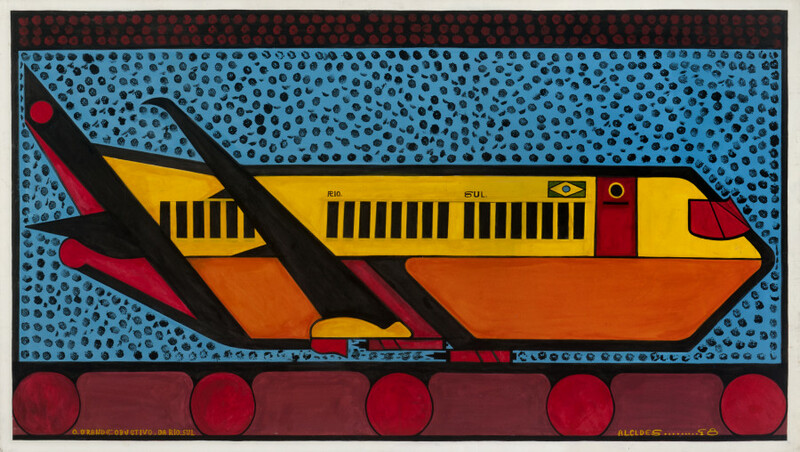 The Outsider Art Fair runs from May 8 until May 11, 2014 at Center 548 in New York. If you just can't wait, check out our preview below.